Let’s be honest: it’s hot. Chores, schedules, and the best-laid plans swim away in the hazy heat of these Louisiana summer days.Sure, you’ve been meaning to build a pool, but finding a pool builder you can trust in Baton Rouge seems like too much work when all you want to do is lie directly under the air conditioning vent for hours on end. So we’ve made it easy. 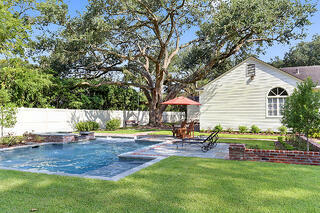 Here are 5 quick tips for finding the Baton Rouge pool builder for you. Check References: Building from your list of potential Baton Rouge pool builders, ensure that each is a good fit for you by checking their references, verifying their business information, and doing a background check. Background checks are available through the Better Business Bureau and ContractorCheck and often list the last completed job they registered for. Meet Face-to-Face: Once you’ve determined that the business is reputable, schedule a face-to-face appointment to discuss what’s important to you. Although phone calls are quicker, personal meetings allow you to interact with them, as well as scope out how they run their office. Meetings are also great way to tell if small personality clashes—that may not show up on the phone—will get in the way of a good working relationship. Get a Bid (with a schedule): The time schedule can vary wildly depending on the type of pool you’ve decided to construct. Concrete and gunite pools take significantly longer to construct than fiberglass pools, because of the concrete-shooting process. An experienced contractor can work with you to decide which pool is best for you and your family. Once you’ve decided on the type of pool, it’s important to compare bids and time schedules. Some bids may be more inclusive, so remember to focus on the services included instead of focusing on the dollar sign. Trust Your Gut: Unexpected complications and delays can occur in any construction project. But when they occur, you want a pool builder with the experience to handle the problems quickly and get your pool back on track. Remember to keep that in mind when comparing the bids. A more expensive bid now could save you headaches down the line. When it’s time to find your pool builder, weigh your options carefully. The pool of your dreams can be more than a heat-induced mirage if you trust your gut and follow these tips.